Paterson and Barrie were executed in Strathaven.Paterson was the son of Robert Paterson, who was killed at Airds Moss. He lived in Cambusnethan parish. He was caught at Charonheugh and taken to Avondale Castle in Strathaven and executed by Captain Bell in 1685.John Barrie was captuired by Peter Inglis in April 1685 and shot. 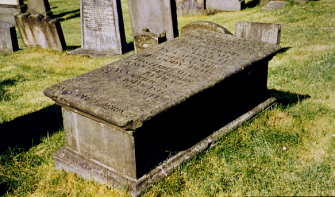 The tablestone to Paterson and Barrie is located within Strathaven cemetery.